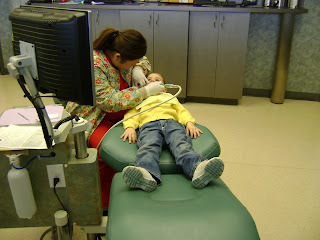 This week Avery had her first trip to the dentist! She was such a big girl and wasn't scared at all. 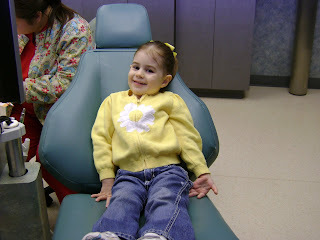 She sat in the big chair, leaned back, let the hygienist clean her teeth and even floss them! 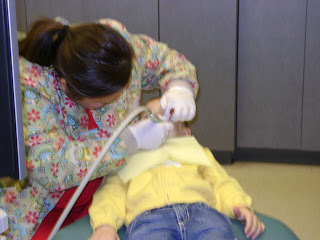 She even let them X-ray her teeth and was very excited to pick out several "prizes" from the prize drawers. This is a pediatric dentist's office and I was amazed to see video game consoles everywhere and each dental chair had its own TV! There were about 6 chairs in a row in at least 2 rooms, maybe 3. So the kids can be distracted by the TV while they're getting their teeth cleaned. I don't think it was necessary for Avery but I understand some kids need it. Anyway, back in 6 months! Of course Bailey sucked on her paci the whole time. 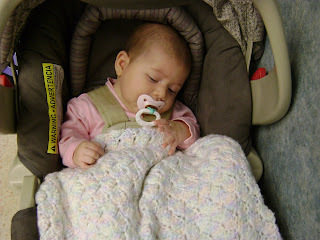 She is the only baby I know who doesn't fall asleep in the car or the swing. I have to give her the paci when we're out because I have usually had to get her up from a nap to go somewhere and she is tired and fussy and won't calm down without her paci if I am going to leave her in the carseat.